Datasouth invited to join concrete5 PRB | Datasouth UK Ltd.
Datasouth has been involved in concrete5 development for over two years and has been more active in its community for just over a year. In September 2014, Datasouth qualified as a Certified Agency Partner. And recently in March 2015, we were invited to join the Peer Review Board (PRB). PRB members aid in reviewing applications from developers wishing to submit applications for distribution through the concrete5 app store. The concrete5 app store is different to other open source marketplaces—such as those offered for Wordpress, Joomla or Drupal—in that all apps must meet a certain standard and undergo a stringent review process. This ensures that the apps work properly with other add-ons, and that these conform to the strict coding standards required for PRB approval. This has been a core value of the concrete5 team since they started the project in 2009. Respected members of the community are invited to join the Peer Review Board to ensure that quality control is maintained and that the app store can be trusted for reliable downloads. 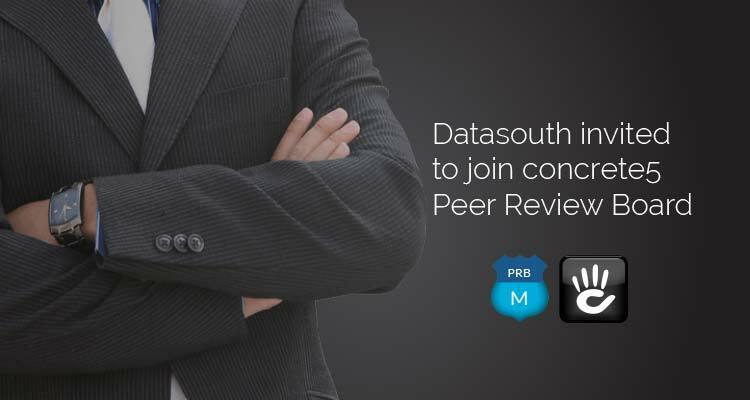 Currently, there are 25 PRB members, Datasouth included. These listings MUST work. They MUST do what they say. If you pay for it and you get no answers on a support ticket at all, you should get a refund. In just accomplishing that we stay miles ahead of Drupal and Wordpress where extensions are very much a wild west and full of abandoned broken stuff. Datasouth has already been on the receiving end of this stringent PRB process. We have already submitted several themes and add-ons to the marketplace, and have received feedback and suggestions from the PRB on ways to improve the code and ensure no detail is overlooked. I appreciate the work of the PRB as it ensures concrete5 apps maintain the highest of standards and eeks out poorly coded, security vulnerable applications which may otherwise have entered the marketplace and damaged the reputation for reliability and stability that concrete5 is known for. Datasouth has always been proud of the way that its developers write structured, well-documented, and commented code. We use Semantic Versioning 2.0 for reference and a GIT repository for version control to ensure an existing code can be maintained and supported by any other member of the team without spending hours figuring things out. The coding standards set by concrete5 sit well with our own personal values on building it right first time! I was involved in the PRB review of this and was impressed by the code. I then purchased a copy for a customer site and it has been performing well. The customer needed a small enhancement to get round a limitation of the actual Sage Pay API and support was fast and helpful. Visit the Datasouth concrete5 member page to view our awards, reviews, certifications and portfolio.